I'm contacting you by email Kimberly! This week I am highlighting Book #3 of The Premonition Series..
We read through 5 chapters per day for the week and then did some fun commentary on what we read. You should check it out as we were quite the funny bunch! Okay friends, we have been reading The Premonition Series furiously for the past two and a half weeks and boy of boy what a read this has been! Anyone else feeling worn out from all of the emotional warfare these angels, Ganacanaghs and other creatures have been putting us through? Well you are not alone! 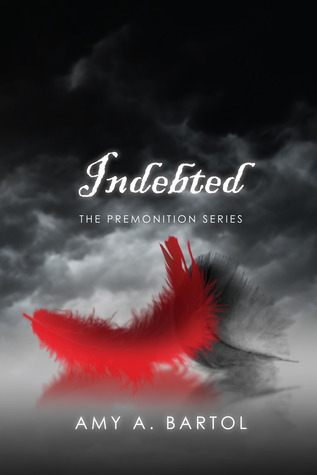 So we thought we would take a quick break from reading today and give you some visual lovin of Indebted. You will certainly need this break as Monday we pick back up at Chapter 17- 21 and then we finish up on Tuesday with 22-26 and trust us when we say that these last chapters are CRAZY! Crazy good, crazy sad, crazy crazy! This picture below is painful! So is anyone else falling for Da Fellas yet? I totally think Amy could write an awesome spin-off with them! Now that they have had a taste of having some woman around maybe we need to find a mate for all the boys?? I will happily console Reed don't worry Evie! Listen to this song...sooo my song with this book! Don't forget my MONTH long giveaway HERE!